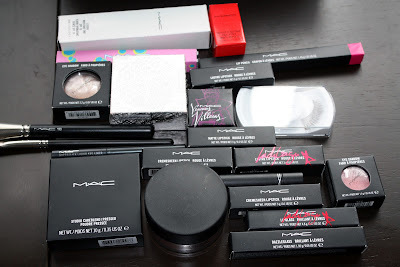 Many bloggers refuse to devote themselves to one brand of cosmetics, and I'm no exception. *Cough*. Okay, the cat's out of the extremely shredded bag. I love MAC Cosmetics. You may be thinking hang on a minute, MAC's super pricy in the Southern Hemisphere. I've been really lucky to say the least. A lot of what you see in the photo above has been given to me as gifts, bought using redeemed vouchers or in Duty Free/Overseas. If you're willing to pay for MAC's high-quality products then it's worth hunting around for the best prices and saving a bit for it. 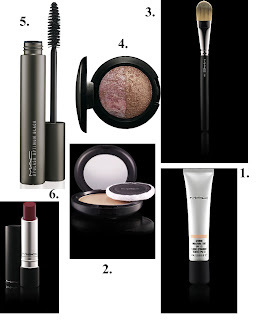 MAC Cosmetics was founded in Toronto by Frank Tosko and Frank Angelo in 1985. Initially the products were only intended to be used by professional makeup artists but they are now sold to consumers worldwide. MAC regularly collaborates with icons like Barbie, Isabella Blow and Alexander McQueen for one-off ranges which always fly off the shelves. Keep an eye out for a Marilyn Monroe inspired range later in the year. Their products are nearly all oil free and even contain natural oils like jojoba which have additional benefits for the skin. I also like that MAC have five social initiatives in place. These include the MAC Aids fund which has raised over 240 million dollars for people with Aids and their Back 2 MAC recycling initiative. This gives you a free lip colour if you bring back 6 empty MAC containers to one of their stores. 1) Studio Moisture Tint, SPF 15 in Medium. 2) Studio Care Blend Pressed Powder in Medium. 4) Eyeshadow in Love Connection. 5) Opulash Mascara in Optimum Black. MAC is available from department store counters around New Zealand as well as at 3 Auckland locations and the international airport. For more MAC follow New Zealand's Senior Makeup Artist, @MAC_Amber_D on Twitter! 1) Product Photography by me. 2) Products I love images from here & Google Images.